Edith passed away peacefully at the Bethany Care Cochrane on December 25, 2017 at the age of 100 years. 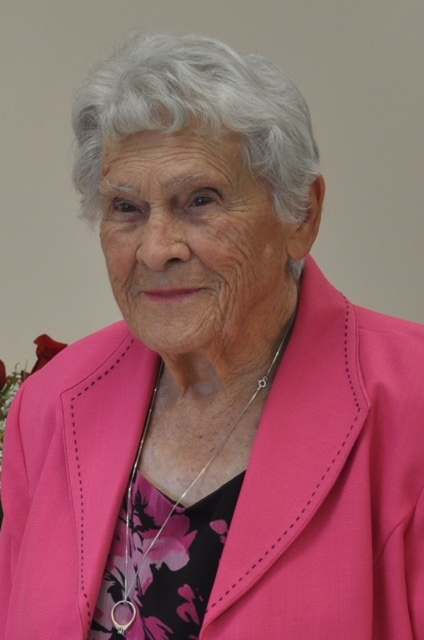 She will be lovingly remembered by her children Frank (Mary Lou) of Cochrane, Ken (Sharon) of Blackie, son-in-law Leonard Gibson of Regina, 10 grandchildren, 21 great grandchildren, and 16 great great grandchildren, as well as numerous nieces and nephews. She was predeceased by husband Roy, daughter Fay Gibson, three brothers and a sister. Edith was the youngest daughter of George and Mary Jane Calloway of Brushy Ridge District and in 1939 married Roy Brooks moving to Brooks Sawmill in the Beaupre area. Edith enjoyed spending time with her family, gardening, cooking, playing cards and recently playing bingo. A Memorial Service will be held at Bethany Care Chapel (302 Quigley Drive, Cochrane, AB) on Saturday, January 6, 2018 at 2:00 pm. In lieu of flowers, donations may be made to Bethany Care Foundation – 1000, 32 Quigley Dr. Cochrane T4C 1X9. Sorry Mary-Lou to hear that your mother-in-law passed. You and you family are in my prayers. We now have one more angel above.May she Rest in Paradise. From Helga Rasmussen and her family.